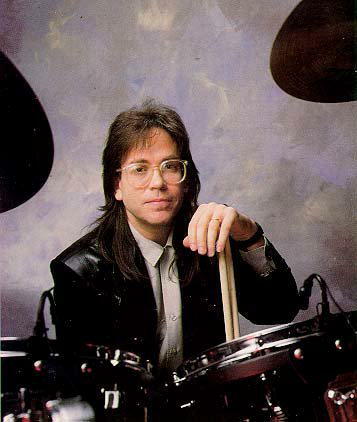 Jeff was born on April 1, 1954, in Hartford, Connecticut, the eldest son of a Los Angeles session percussionist Joe Porcaro. His brothers Mike Porcaro and Steve Porcaro are both still active session musicians. He also has a younger sister, Joleen. On October 22, 1983, Jeff married Susan Norris, a Los Angeles television newscaster. They had three sons, Christopher Joseph (born July 3, 1984), Miles Edwin Crawford (born June 12, 1986), and Nico Hendrix (born December 26, 1991). Jeff began playing at the age of seven. Lessons came from his father Joe Porcaro, followed by further studies with Bob Zimmitti and Rich Lapore. From the very start of his career, Jeff was viewed as one of the music industry’s top drummers, possessing an impeccable sense of rhythm as well as a versatility that bridged virtually every style. Jeff was no stranger to the L.A. music scene growing up and, when he was just seventeen, he got his first professional gig playing in Sonny and Cher’s touring band. From there he went on to play on several Steely Dan albums before co-founding Toto with childhood friends Steve Lukather and David Paich. Jeff is thought of today as one of the most innovative drummers of his generation, and an example to other musicians who seek to absorb and blend a wide array of musical styles. Besides his work with Toto, he also performed with artists such as Bee Gees, Sonny and Cher, Paul McCartney, Willy DeVille, Steely Dan, Jackson Browne, Donald Fagen, Ricki Lee Jones, Michael Jackson, Madonna, Bonnie Raitt, Dire Straits, Mark Knopfler, Pink Floyd, David Gilmour, Boz Scaggs, Roger Waters, Paul Anka, Eric Clapton, The B-52’s, Joe Walsh, Lionel Richie, Earth, Wind & Fire, Burton Cummings and Bruce Springsteen, Larry Carlton. He also had connections to Van Halen. Richard Marx dedicated the song “One Man” to him and said Jeff was the best drummer he had ever worked with. Jeff Porcaro suffered a fatal and unexpected heart attack on August 5, 1992 at the age of 38. He was using a pesticide in his yard and an allergic reaction to the substance triggered the attack. An autopsy revealed a serious heart condition that had been previously undiagnosed. Jeff’s funeral, attended by an estimated 1,500 people, was held August 10 in the Forest Lawn – Hollywood Hills Cemetery, where he was buried. The Jeff Porcaro Memorial Fund was established to benefit the music and art departments of Grant High School in Los Angeles where Jeff was a student in the early 1970s. It also provides four scholarships each year to Grant High School seniors. A memorial concert took place at the Universal Amphitheater in Los Angeles on December 14, with an all-star line up that included Boz Scaggs, Donald Fagen, Don Henley, Michael McDonald, George Harrison, Eddie Van Halen, and, of course, Toto. The proceeds of the concert were used to establish an educational trust fund for Jeff’s sons. Jeff is survived by his wife, Susan, sons, Christopher, Miles, and Nico, parents Joe and Eileen, brothers Mike and Steve, and sister Joleen. Tracks: Georgy Porgy, I Keep Forgettin´(Every Time You´re Near), Beat It, Guess Who´s Looking For Love Again, What A Fool Believes, All Right, Mornin´, One Step Ahead Of The Bad News, Spanish Flight, Gimme The Goods, Nothin´You Can Do About It, Rosanna, Room 335, Haven´t We Come A Long Way, You Should Hear How She Talks About You, Why Do Lovers Break Each Other´s Heart? & Song For Jeff. Musicians on the Session Works II album: Jeff Porcaro, Toto, Cheryl Lynn, Michael McDonald, Michael Jackson, Ned Doheny, Aretha Franklin, Christopher Cross, Al Jarreau, Randy Goodrum, Rodney Franklin, Boz Scaggs, Airplay, Larry Carlton, Eric Carmen, Melissa Manchester, Daryl Hall, John Oates, Los Lobotomys and others. Tracks: Moodid, Low Down, I Don’t Want You Anymore, Wait, Drived A Crooked Road, Human Touch, Paradise, Africa, I Found Love, It’s Over, Human Nature, Stranger In Paradise, Confide In Me, Come Closer, Isn’t She Lovely, When A Man Love A Woman & Home Of The Brave. Musicians on the Session Works album: Jeff Porcaro, Toto, Boz Scaggs, Bill Champlin, Jacksons, Steve Lukather, Bruce Springsteen, Herbie Hancock, Denice Williams, Michael Jackson, Dwayne Ford, The Manhattan Transfer, Tom Scott, Lee Ritenour, Michael Bolton and others. Tracks: CD1: Gipsy Train, Never Enough, Child´s Anthem, I´ll Supply The Love, I´ll Be Over You, How Many Times, Georgy Porgy, 99, If It´s The Last Night, Angela & I Won´t Hold You Back. CD2: Africa, Kingdom Of Desire, Jake To The Bone, Don´t Chain My Heart, I Can´t Stop Loving You, Rosanna & With A Little Help From My Friends. Musicians on the Tribute to Jeff Porcaro album: Toto and others. Tracks: CD1: Intro, Gypsy Train, Childs Anthem, I´ll Supply The Love, I´ll Be Over You, I Keep Forgettin´, Takin´It To The Streets, Home Of The Brave, David Paich Solo, Georgy Porgy, 99, If It´s The Last Night, Angela, I Won´t Hold You Back, Don´t Stop Me Now, Africa & Percussion Solo. CD2: Intro, Chain Lightning, Josie, Drum Solo, Little Wing, Kingdom Of Desire, Jake To The Bone, Low Down, Lido Shuffle, Angel Don´t Cry, Don´t Chain My Heart & Rosanna. CD3: Intro, Dirty Laundry, You Better Hang Up, I´m With You Rain Or Shine, Let Me Stand Next To Your Fire, Ain´t Talkin´Bout Love, Hold The Line, Steve Lukather Interview (German Radio) & The Seventh One (Bonus Track). Musicians on the Jeff Porcaro Tribute Concert album: Steve Lukather, David Paich, Mike Porcaro, Simon Phillips, Chris Trujillo, Jenny Douglas-McRae, Donna McDaniels, John JesselJames, Lenny Castro, Michael McDonald, David Crosby, Denny Dias, Donald Fagen, Boz Scaggs, Don Henley, Eddie Van Halen and others. Tracks: CD1: Gypsy Train, Childs Anthem, I´ll Supply The Love, I´ll Be Over You, Takin´It To The Streets, Home Of The Brave, David Paich Solo, Georgy Porgy, 99, If It´s The Last Night, Angela, I Won´t Hold You Back & Africa. CD2: Chain Lightning, Josie (incl. Drum Solo), Little Wing, Kingdom Of Desire, Jake To The Bone, I Wonder Who, One For The Road, Angel Don´t Cry, Don´t Chain My Heart & Rosanna. CD3: Dirty Laundry, You Better Hang Up, I´m With You Rain Or Shine, Let Me Stand Next To Your Fire, Ain´t Talkin´Bout Love, Hold The Line & With A Little Help For My Friends. Musicians on the We Never Be Over You album: Steve Lukather, David Paich, Mike Porcaro, Simon Phillips, Chris Trujillo, Jenny Douglas-McRae, Donna McDaniels, John Jessel James, Lenny Castro, Michael McDonald, David Crosby, Denny Dias, Donald Fagen, Boz Scaggs, Don Henley, Eddie Van Halen and others.